The Intercontinental Leonardo da Vinci Airport, shortened to Rome Fiumicino Airport, is an Italian airport located in Fiumicino, near the city of Rome, 28 kilometres from the centre of the capital. 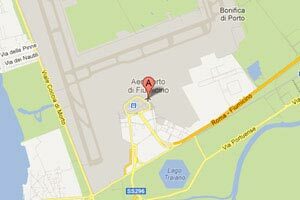 It is the biggest airport in Italy. The traffic of almost 38 million passengers in 2011 makes it the first national airport and the eighth largest airport in Europe for total passengers after those of London Heathrow, Paris Charles de Gaulle, Frankfurt, Amsterdam, Madrid, Istanbul and Monaco. Together with the Rome Ciampino airport creates the Rome airport system with about 42 and a half million passengers per year (2011). The Rome Fiumicino Airport has four terminals at the moment reserved for domestic, intercontinental and international flights. The airport operates since 2005 with precision instrument landings. To cope with the increase in air traffic and the limited possibilities of development of the Ciampino airport, the Italian government since 1947 started to work to find a suitable area to provide Rome with a new airport. Three areas were initially identified: the Magliana Vecchia in the south-west of the city, Castel di Decima (southern suburbs) and Casal Palocco (more decentralized, along the road to Ostia). The Directorate General of Civil Aviation in 1952 introduced a new project for the construction of an airport in an area close to the mouth of the Tevere, with two perpendicular runways. For the airport, an architectural solution that took elements from the two projects presented was chosen: that of Riccardo Morandi and Andrea Zavitteri (winner of the contest) and that of Vincenzo Monaco and Amedeo Luccichenti (from which were adopted some solutions). The final draft was approved in August 1958 and the works for the construction of the airport lasted 21 months. The airport was officially opened on January 15, 1961 with two runways and replaced Ciampino airport, which remained in service for domestic flights and charter flights. The first airliner to land at Fiumicino, on the night between January 14 and 15 was a TWA Lockheed Constellation. The aircraft came from New York and had made a technical stop in Tunis. The Leonardo da Vinci, however, had already received since August of 1960 some charter flights to relieve air traffic congesting Ciampino during the Olympics. During the sixties Alitalia significantly invested in the new airport, building hangars and maintenance facilities. In 1973 the third runway was opened and a new hangar was built to accommodate the Boeing 747. The Civil Aviation Authority has dedicated two ways of the airport to Alitalia pilots Alberto Nassetti and Pier Paolo Racchetti, died June 30, 1994 in Toulouse in a plane crash. Most of the roads in the airport perimeter are named after pioneers air and pilots of the two world wars. There is also a traffic circle in honour of the victims of the Linate disaster on October 8 2001. The Rome Fiumicino Airport is connected to the capital and other towns in Lazio by bus and trains but the car hire is another valid options if you prefer being free and independent while moving from a place to another.